Young Engineers have competed fiercely at the annual end of season Gravity Race held at Cornbury Park this week. Motorsports students raced cars they had designed and built in a tight competition spanning the entire day. Some cars were damaged at the high speeds achieved, with one car losing both front wheels. This was repaired using spare parts by the resourceful final year students, who went on to complete some successful time trials in the repaired vehicle. Innovative design solutions were deployed on track, leading to surprising results. Race Organiser, Brian Eade commented “This has been a fantastic day. The student efforts over the year shows through, with the advanced engineering skill these students have learned translating in to the fast times we see here today”. Gravity racing is highly competitive, motorsports students competing advised in this formula "focuses their minds" on key elements of their sport. “There is no motor of course, but we are Engineers rather than mechanics” said student Gus Derry, one of this year’s finalists. “The suspension, steering, breaks and aerodynamics we do here are the heart of all motorsports”. Final year Level Three students at Bicester Motorsports complete Cornbury, and also a Motorsports Preparation event at Brands Hatch each year. The foundational skills they learn in welding, machining, and 3D design in their first year set them up for this active second year. These skills see many of these students go on to full time employment in the local motorsports industry. 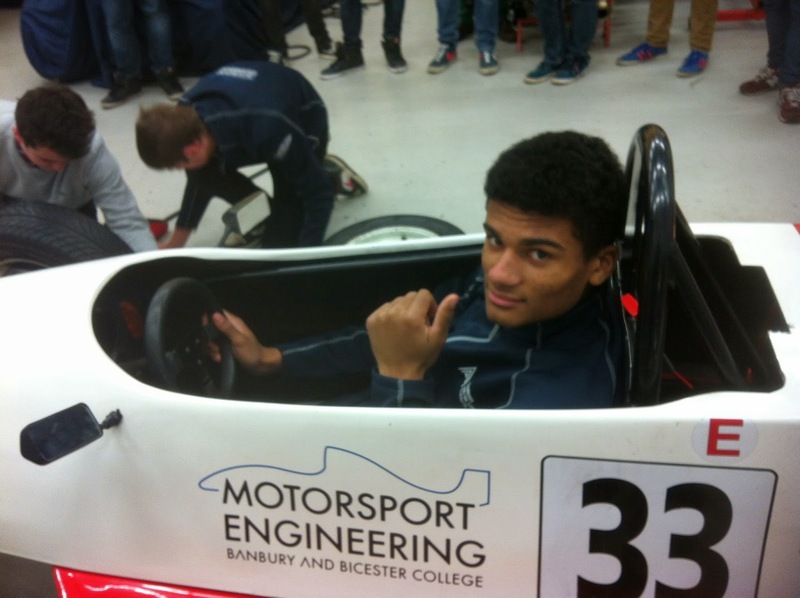 Bicester Motorsport (formerly OCVC Motorsport College) teaches Motorsport and Engineering to young people and those seeking new careers in the motorsport industry. To gain a wider understanding of the motorsports industry so you can progress to higher education or a motorsport apprenticeship, study our Extended Diploma in Engineering Motorsport. Our students go on to work in industry or get places at universities. Each year students go from here to work in F1 and related or supporting industry. We currently have students or former students working at Lotus, Force India, Red Bull and Prodrive. By studying and training at our specialist motorsports engineering campus at Bicester you’ll gain first-rate experience and a qualification that gives you the equivalent of three A-levels. End of term Race Tests are the big push at Bicester this year. We have two Formula Renaults and a Formula First car which have been fixed up and tested this year by our students. The cars now run smoothly, and students are responsible for working in teams to keep them that way, and experiment to make their car go the fastest. Parts for the cars have been fabricated and 3D printed on site by us. "This is where we are meant to be" said Rob Alderman, Motorsports Prep Teacher and the man responsible for this. "The cars are working well, and thanks to student effort this year has seen better performance than we have achieved previously. The cars are actually running better than expected". This Friday is the test at Brands Hatch for the level 3 course, and the second test for Bicester Motorsport after the shakedown last week, and students will head down for an entire day track-side to take part. "All students are expected to take part, and they gain a lot from the experience". Bloodhound have arrived at Bicester Motorsport in an exciting week, and have set up in the Motorsports Workshop since Monday this week. They will stay for a full week of excitement, employment events, industry meet ups, and the open day this coming Saturday. We’ve had a successful first two days at Bicester Campus, with extremely positive feedback from all the schools and teachers that have attended. Today we are looking forward to visits from a number of companies and STEM technologists from the local area. The week continues this Saturday with the open day from 10-1pm. If you or your company with to attend one of these events, please give us a call our switchboard to book an appointment or make enquiries on 0808 168 6626. A UK project to break the world land speed record is coming to Banbury and Bicester College. Bloodhound SCC is a high-technology project to design and build a car that will break the 1,000mph barrier. 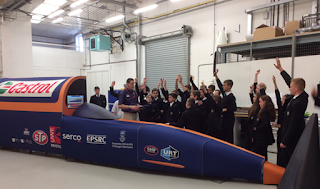 On Monday 20 April the Bloodhound STEM roadshow arrives at Banbury and Bicester College’s Bicester campus to offer local young people a host of related activities. The roadshow, featuring a full-sized model of Bloodhound SCC, will be at the campus in Telford Road for a full week, culminating with the college's open day on Saturday 25 April. Schools are being invited to get involved by organising trips for pupils in Years 3 to 9. The free roadshow will feature engineering and computer science activities to inspire young people into pursuing careers in science, technology, engineering and maths. Up to 120 pupils can attend each day. Any schools wanting to find out more and book a visit to the roadshow can visit the dedicated web page and complete the online form. Anyone else keen to visit the roadshow can do so at the Banbury and Bicester College open event at the Bicester campus, in Telford Road, on Saturday 25 April, 10am until 1pm. Motorsport engineering students from Banbury and Bicester College are to design, build and race their own electrically-powered car in a national championship. The Greenpower IET Formula 24+ championship pits teams over a series of 60-minute races, including a final round at Goodwood Motor Circuit. All cars will have to perform using only a 12volt battery unit, supplied by Greenpower. Just like Formula 1, teams can outperform their competitors with innovative technology, aerodynamics, engine power, strategy, team work and invention. But unlike Formula 1, the team from Banbury and Bicester College must achieve this with very little budget and fit it around their studying. By using the facilities at the Bicester campus, the trio of students, all aged between 16-18 years old, are well into the design phase of the project, with concepts and individual components around the car already drafted. The next stage will be perfecting and narrowing down their concept designs and beginning testing. Chris Cousall, one of the team members, said: "We are relishing the experience this is giving us. We've had to be extremely proactive, entrepreneurial and work as a team. We're hoping this will become a tradition and we can pass the project down to next year's intake at Banbury and Bicester College for them to enter. "The hardest part has been finding sponsorship. Although we can design, test and build the car using college facilities, we still need more money. So we're now actively trying to find businesses who would like to sponsor us." So far the team pitched their entry into the championship to the college teaching staff, who agreed to cover the cost of application. 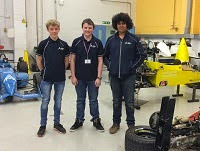 Chris Cousall, Lewis Mackenzie and Keaton Church are all currently studying the Motorsport Engineering Level 3 Extended Diploma at the Bicester campus of Banbury and Bicester College. 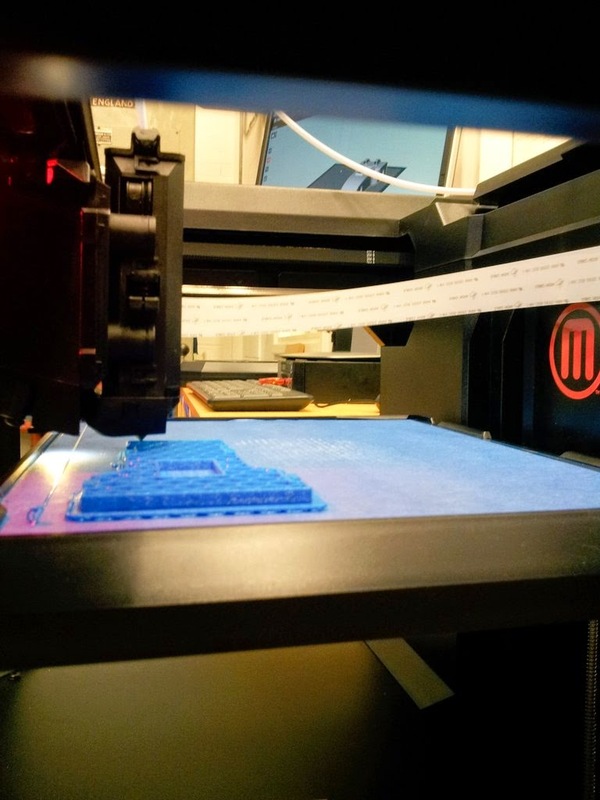 Bicester Motorsport has come into possession of a Makerbot 3d Printer, which has been installed and fitted into the CNC workshop facility. This printer has been tested by trained technicians and is now available for student projects. The printer was obtained after staff at the campus applied for a capital bid for the equipment. Rapid prototyping is a key area of motorsport today, with some aspects of current Formula One cars being printed for the final car. The technology is also used in prototyping, and Bicester Motorsport has a large collection of donated 3D printed parts which were used last season. Former student Ben Dew, now a Laminator at Lotus F1 recently paid Bicester a visit to help us tell new students about the college. Ben has been working for Lotus since 2012, after attending the equivalent of our current two year extended diploma and later securing work at ProDrive. This path has eventually led his career towards Lotus F1, who are looking to remain strong competitors in the sport. Lotus F1 are aiming to reach the pinnacle of F1 with their new car for 2015 (see here), and as a Laminator Ben will be key to bringing this about. Bicester Motorsport is hosting an open evening so that potential students can talk with staff and see our faculties here in Bicester. Visitors are invited to come and see the workshops and enquire about the many possible career paths that we can facilitate with the courses and apprenticeships we offer. The open evening is to be held from 4 until 7pm on the Wednesday afternoon, and is expected to be a busy event. Each year we have many applications for the courses we offer here which are in high demand due to the nature of the colleges work. Those looking to attend should ideally phone the college (0808 168 6626) to confirm their attendance in advance in the days before the event. Bicester Motorsports, formerly OCVC, are seeking former students to add to the Hall of Fame which is being compiled to demonstrate the high number of our students who get jobs in the motorsports industry. As one of the oldest motorsports colleges in the UK, Bicester Motorsports is a dedicated campus which has given many hundreds of students a positive start to their careers in motorsports. They are well placed to help, with established linkes with Force India, Prodrive, Lotus, Caterham, and a location near to many hundreds of supportive companies and suppliers. Figures for the last two years show that more than a third of students go on to work in motorsports at the high end, and apprenticeships with motorsports teams are growing year on year. So many students have achieved success in industry that staff have lost track of many of the successful, and we have begun plans to honour those who have been so successful by setting up an alumni association and Hall of Honour. If you are a former student, or know a former student of ours, please get in touch. (C) Bicester Motorsport, Banbury and Bicester College, Activate Learning. Simple theme. Powered by Blogger.